The frontflip, the newest stunt in the field of spectacular freestyle motocross. But it can get even crazier! 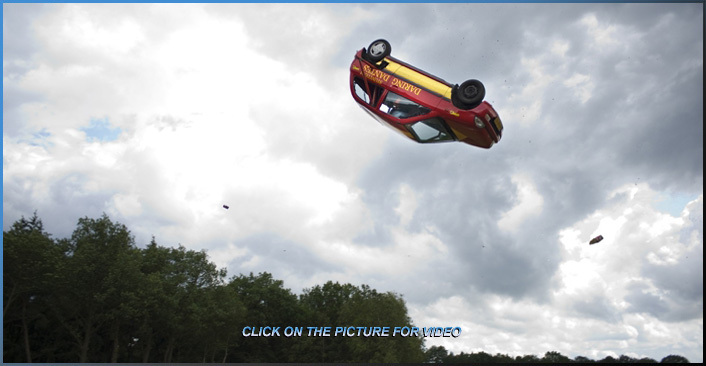 A front flip with a car. Tour audience will not believe the announcements of the stunt in press releases and on social media. The public will not believe there own eyes during the stunt. And after the event, the most frequently heard word will be "unbelievable". To be able to carry out this stunt, a lot of space and a lot of preparation is needed. A very high, heavy ramp is placed very securely in the stunt arena. Two piperamps are welded on top of the ramp. A beautiful sight that clearly and unmistakably announces the spectacle that you promised during your event. On the day of the event a fully prepared car is ready for the front flip. The most visible preparation on this car is the pipe, which is inserted through the back of the car and welded to the roll cage. When the time comes, and your audience has gathered around the high ramp, the car drives up the ramp at high speed. The car runs exactly between the two piperamps, but the car's rear is thrown up by the pipe attached to the car by the piperamps. This energy continues during the entire jump of the car. This will cause the car to turn and, if all calculations are correct, land on its wheels. Your audience will go completely crazy and this will be talked about for many years to come. For you as an organization it is of course important that all this happens safely. And of course that is also very important to us. The car is professionally balanced in advance, equipped with a roll cage, four-point seat belt, race seat, racing tank and safety switch. The stuntman himself is also fully protected with helmet and neck brace from the Formula 1 racing scene. A connecting body protector, fire retardant clothing and much more protective gear. Everything is accurately calculated in advance and a complete safety team is ready to intervene where necessary. Nothing is left to chance to make the car front flip go smoothly and safely. But your audience does not need to know that. Let them enjoy the illusion that it is really all extremely dangerous. "That almost went wrong last year!" Is the best advertisement to ensure that your audience will come back to your event this year.